The former Indian prime minister Atal Behari Vajpayee has been honoured with the country's highest civilian award. Authorities announced the Bharat Ratna (Jewel of India) for the senior politician from PM Narendra Modi's BJP party a day before he turns 90. A charismatic leader and a master orator, Mr Vajpayee retired from active politics in 2005. Educationist and freedom fighter Madan Mohan Malaviya has been given the award posthumously. He is best known for setting up the Benaras Hindu University (BHU) in Varanasi in 1916. He died in 1946. So far, 43 people have been given the Bharat Ratna, including cricketer Sachin Tendulkar, musician Ravi Shankar, singer MS Subbalakshmi, filmmaker Satyajit Ray, South African leader Nelson Mandela and a pioneer of India's missile technology and former president APJ Abdul Kalam. "President Pranab Mukherjee has been pleased to award Bharat Ratna to Pandit Madan Mohan Malaviya (posthumously) and to Atal Behari Vajpayee," according to a statement from the Rashtrapati Bhawan (presidential palace) on Wednesday morning. Mr Vajpayee, often described as the "moderate face" of his Hindu-nationalist Bharatiya Janata Party (BJP), enjoyed a wider appeal than his more hardline party colleagues. He served as India's prime minister for six years spread over two terms. Since his retirement, he's not been seen in public and reports say he is in bad health. The award has been welcomed by senior BJP leader LK Advani. "A Bharat Ratna for Atal Behari Vajpayee should not be seen in terms of a reward for doing his duty but as an award that recognises his stature. 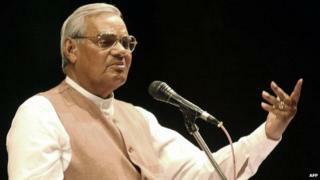 It would be very appropriate and befitting for a patriot like Vajpayee," he told an Indian television channel.